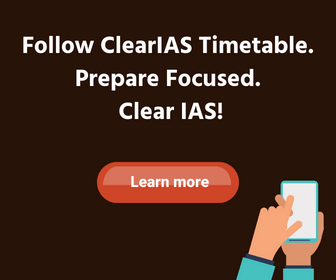 This is question set #15 of ‘Clear IAS Mains High Value Answer Writing Test Series’. Mains High Value Answer Writing is a UPSC mains oriented program from ClearIAS.com that consists of 5 questions in each post, published around 8 pm every day. Each of the 5 questions are selected from 5 papers mentioned in UPSC Mains syllabus namely Essay, GS1, GS2, GS3 and GS4 (ethics). Selected questions of high probability to be asked UPSC mains are included in each of these mini tests. Aspirants can choose any question they wish to answer in the comment space provided below, specifying the question number and question topic. Ans : conflict of interest is a situation in which the person has a private or personal interest sufficient to appear to influence the objective exercise of his / her official duties say , of a public official . individuals play multiple roles with different interests in daily life . these interests are bound to conflict with each other . the case of a public official who has public interest ahead of any other interest be it his / her personal interest or any financial interest . the most common instance of conflict of interest in medical sciences is when a doctor prescribes a medicine of a particular brand which provides him / her an incentive even when he is aware of some other brand of same drug which is more effective or economical etc for the patient . the mere presence of professional code of conduct will not make a professional immune to such conflicts . what is required is the integrity of such individuals who put their self interest before public good . –	Tropical cyclones: caused by low pressure, high moisture region (over sea) surrounded by high pressure, low moisture region. –	Sub-tropical cyclone: caused by warm and cold fronts backed by warm and cold air respectively. –	Extra tropical cyclones: caused by warm and cold fronts. –	Polar cyclones: caused by polar low formation behind cold fronts in polar regions. While tropical cyclones are formed over sea, temperate cyclones can form over land aswell. Latter are formed by difference between moisture content between airs, former is formed by difference in temperature of air masses. Latter has diameter between 200 and 1000 kms, former has diameter between 1200 and 1800 kms. Latter are characterised by low pressure centres while former are characterised by warm and cold fronts. Tropical cyclones are formed in the tropical zone while temperate cyclones are formed in the subtropical/temperate zone. –	Under emergency India acts like a union state with centre having all the powers over the states. –	Unlike USA, India doesn’t have separate constitutions for each state but one common constitution. –	Citizens do not enjoy two citizenships (state and nation as in USA) but only one. –	Centre has a say in the states functions through governors and IAS, IPS and IRS officers. –	States can not have independent say in taxation and financial matters. Centre controls finances through financial commission. –	Central government can change the boundaries or create new states from existing states without state’s consent. Ex. Creation of Telangana. –	There is a uniform and united judiciary. (unlike federal and state courts). –	Father of Indian constitution Dr. B. R. Ambedkar defined India as a ‘union of states’ and not a federation of states. As evident from above points, we can see that founding fathers of India created the constitution of India keeping in mind the unique conditions and requirements of the nation. Though individual acts of constitution are inspired from different nations, overall, the federal structure of India is unique in the world. –	In 1999, patent on product laws were re-introduced, however they weren’t absolute. It was the transition period and so patents were allowed to be filed on transitional basis, retrospective to 1995. However, International Intellectual Property Index ranked India the last rank out of 25 major economies and there have been many claims from developed countries about lax intellectual property rights in India. This came to highlight after the Novartis case for patent of Gleevec in which Supreme Court of India upheld the rejection of application for patent by patent office. Recently the minister of state for commerce and finance declared that the government will come up with new policy on Intellectual Property rights. This is a step to boost R&D in India and strengthen IPRs to bring them at par with TRIPS agreement. Conflict of Interest arises when a person has multiple interest and the secondary interest has more weightage than the primary interest and can adversely affect them. If a manager realises that dysfunctional products have been sent out to clients that may not be found by the customer for a long time and it was the responsibility of a close friend to avoid the same. Pointing it out and calling the products back would jeopardise his friendship, however not pointing it out would discredit the employer. In automobile safety test it was realise that the brakes on the recently launched vehicle were problematic and could fail under heat. However many models have been sold and a call back would not not cause massive losses to the firm but also dent the image of the manufacturer. However avoiding the rollback could lead to accidents and loss of innocent lives. Ans. Yes the Indian federalism is Federation Sui generis and it is our constitution makers and their wisdom on the need of this diverse cultured country, who has given such an unique federation to the nation. In all other federal nations like USA, the power of governing the nation is evenly distributed among the constituent states but in India there are constitutional separation of power defined in the three list of the 7th schedule. The third list makes the federation truly sui generis as it list the concurrent subjects with residuary power to the Centre. On the one hand Single & Written Constitution, President strengthen the federal character where as the amendability of the constitution, All India Services, Election Commission etc make the nation more unitary. The devolution of financial power by the Centre to the states is also limited and presence of the office of Governors appointed by centre again limits federal character. In Parliament, states are represented in the Upper house but the numerically dominant strength of the lower house neutralizes that. Mandatory ratification of certain bills by 1/2 of the states strengthen federalism but provision of amendment of other parts by simple majority weaken the federalism and strengthens unitary nature. Considering the legacy inherited from the British, exiting sentiments of different regions,religions,linguistic groups and the diversities, this Sui generis federation was most suitable for a nation coming out of 200 years of oppression and striving to develop and stand on its own feet. The Indian Patents Act 1970 was implemented in 1972..The Indian Parliament amended the Patent Act in 2005, keeping the interest of public health at the centre in accordance with Doha declaration and TRIPS. The Act extends product patent protection in all fields of technology and allowed for patenting of embedded software.The Act provides safeguards, including checks on ever-greening of patents and broader framework for compulsory licensing.With reference to Gleevec, in the absence of evidence of enhancement of known efficacy, the mere discovery of a new form of a new substance was not regarded an invention deserving the grant of patent. The first compulsory license in India was granted for Naxavar. While for Dasatinib, the compulsory licensing was not approved. India continued to score lowest in International Intellectuaal Property Index. In US -Special 301 Report , India remained on the Priority Watch List. -a separate bench for the IPR cases shouldbe established. 1. there is no separate Constitution for the State. 3. the Parliament can change the territorial extent of the state even without the consent of the State concerned (Art 3). 4.the Parliament can make laws on subjects exclusively under the State List during national emergency under Art 352. 5.The Parliament can give directions to the States on how to exercise their executive authority in matters within their charge. 7.If financial emergency is declared by the President under Art. 360 ,all the Money Bills passed by the State Legislatures during the period of financial emergency are also subject to the control of the Centre. 8. Under Art. 256, the Centre can give administrative directions to the States, which are binding on the states. 9.Under Art. 312. All India Services officials IAS, IPS and IFS are appointed by the Centre, but are paid and controlled by the State. However, in case of any irregularities by the officer, States cannot initiate any disciplinary action except suspending him/her. 10. Judges of the High Courts are appointed by the President in consultation with the Governors under Art. 217 and the States do not play any role in this. Thus the Indian Constitution is a flexible form of federation : a federation of its own kind. Media is a vital force in democracy. It is the media through which information is disseminated to common people. Media is the backbone and fourth pillar of democracy. Be it electronic media or the print media, it had played a vibrant role to shape the thinking of the society. The media had played a revolutionary role during struggle of independence to mobilize people and their thinking. It also helps individuals to form opinion, enlightening voters, protecting human rights, promoting secularism and help government to be transparent and accountable.Since the economic liberalization of the early 90’s, Indian electronic media scene has changed from a state-monopolized single channel to market-oriented multichannel web. In last 20 years it has developed by leaps and bounds but structurally changed from the state monopoly to a corporate monopoly. Today, the media has become more inclined towards corporate tycoons and politicians. The news channels today are owned by big corporate houses. It is clearly evident that few channels and few newspapers cover a large chunk of population. The regional newspapers are somehow losing the readership may be due to economies of scale.The media shows or publishes the information which is in favour of the business of a particular corporate and tries to humiliate the image of other corporates. The illiterate population of India gets misguided by such a biased view of media which in turn serves as an impediment to their growth. The news channels today do not show the plight of farmers, suicides prevalent among farmers, programmes on agriculture which is need of the large rural population of India who are dependent on agriculture and allied activities for their livelihood. Rather news channels have dedicated time for the reality show outcomes, comedy shows and serials of big production houses. Have we ever heard of the agriculture or labour correspondents in the news channel. The media is moving away from its reponsibility of showing the real information regarding society and happenings round the world which may have an impact.The media in hands of corporate houses have become more concerned regarding the bottom line and gimmicks rather than the quality content. The elimination of rivals is the nature of competitive environment prevalent but the monopoly or influence of a few in media is not good for democracy. The source of information in media should include voice of all sections of the society. To achieve this, ownership of media should be in hand of such persons who diligently wants to work for all the segments of the society. The newspapers today lobby the pursuits of big corporate houses from which large revenue is obtained for advertisements. The advertisements are placed with the news columns in such a way as to misguide the reader or let him comprehend the news in favour of a party. The other side of the news has lost relevance among the race to earn profit. The public has the freedom of speech and expression and the right to information which in present scenario has been curtailed in a very deceptive style by media. The media has succumbed to malpractices and corruption. The distorted information, promotion of certain political groups, business magnets, products and services and maligning the rivals has hampered the image of the media.The behind-the-scenes influence of corporate and vested interests was made particularly apparent by the leaking of tapes recording conversations between Niira Radia, a powerful lobbyist with clients such as the Tata group and Reliance Industries, and a variety of business men, politicians, and journalists. The ‘paid news syndrome’ has now become a common feature of the media. In the last parliamentary election the media and print media indulged in monetary deals with particular political parties by agreeing to publish their views and not the views of the rival candidates. Though voices of concerns were raised by Journalists unions and civil service society, a concrete report is yet to be arrived at. It is the utter need now that the media should work as a partner in national mission and provide solutions by nationwide consultations. According to the TRAI’s report, vertical integration in the media market is already causing serious problems. The large conglomerates of the Indian media own different companies. The broadcasting and the marketing rights both are given to different subsidiariy companies. The vertical integration can result in anti-competitive behaviour, whereby a distributor can favour his/her own broadcasters’ contents over the content of a competitive broadcaster. In this scenario, large conglomerates would be able to impose their preferred content which is a clearly dangerous situation.The restrictions needs no longer to be placed on companies but on entities or groups. Due to absence of such restriction in India it clearly helps companies lobby for the business interests. Being the watchdog of the nation, the media should effectively shoulder its responsibility. The media ethics or the moral principles need to be followed. In modern democracy, the few elements which are associated with media ethics are transparency, integrity, honesty, public accountability, objectivity and impartiality. Media should exercise the freedom of speech and right to information enshrined by our constitution to the citizens of which media is an important part. The need of self-control by media is good for society. The media should reflect diversity of the content and should not publish such information which may lead to violence or induce communalism.The media should be ready for society intervention if it does not deliver as per the professional standards. The role of editors has been no longer the same in media. Earlier the editors used to decide about the content and advertisements and where they have to be placed. But due to corporatization of media, the editor has become a mere puppet in the hands of corporate houses. The managers and the directors are now the ultimate decision makers. They desperately ignore the relevant news which may enlighten public awareness and good governance of the country. The responsibility of media as a watchdog of the nation could be more properly handled by the editors than the owners who just work for increase in capital and profit. Public service broadcasting has gone a long way in creating awareness than private service broadcasting. The private service broadcasting regards the viewers as consumers and not the citizens and is generally controlled by corporate houses and family interests. Since Doordarshan has auctioned its part of the evening slot to the private broadcasters to maximize revenue, it has led to a situation where Doordarshan does not own the programme as well as the marketing content thus giving way to a chaotic scenario. The efficient working of public broadcasters is the only way to make private broadcasters realize and make changes in their policy. The meaningful distribution of news among the common people, stringent laws regarding corporatization of media and the solutions to deal with political parties pressure can go a long way in enshrining the image of media which is an eminent part of the daily life of people. The media should ensure that the growing competition should in no way make heterogeneity and plurality of the nation suffer. The laws regarding vertical integration of media need to be addressed so that diversity of the news is not affected and is streamlined for public good. The public service broadcasters and the alternate media should be brought on the forefront to provide a level playing ground and report the stark realities with fairness and honesty. Suggestions for improvement: Essay should look like an essay, and not like a GS answer. It should have a flow and connection from beginning to end. In an essay, you have the freedom to use your creativity and imagination to make it interesting. Give a better introduction and conclusion to impress the elevator. Stress on your core points. Your view/stand on the essay should be clear. Elaborate the current Patenting regime in India. What are the reforms that can be brought in related to Intellectual Property Rights (IPR)? Analyze. Patent is a creation or innovation and hence an intellectual property. Under law the government bans public access to the patented product or process. A strong patenting regime and IPR protection is required to protect the consumers, encourage innovation, R&D efforts and prove to be beneficial to economy at large. 1. The indian patents act 1970 later amended in 2005 to make it compliant with the TRIPS as india became a signatory to the GATT under WTO. The amended patents act provides for products patent, abolished exclusive marketing rights provision. 2. There is provision to prevent ever-greening of patents where in the patent holder avails protection by making changes to the extant product itself, thus there is no new creation. This was upheld by the SC in the Glivec case. 3. The present regime also provides for compulsory licensing under which a generic producer can produce without the sanction of the patent holder. This is done to uphold public interest at large. 1. stronger protection and encouragement to domestic private sector to boost the R&D in various fields. 2. Shift from only export oriented activity to global marketing, thus assist to establish strategic marketing alliances that will provide indian companies access to distribution networks. 3. boosting the generic industry in the pharmaceuticals sector by promotion of generic drugs through government hospitals thus making the important drugs accessible and affordable to common people. The boost to IPR in the country can indeed serve the needs of the economy through encouragement of domestic innovation and R&D. DD Basu holds that Indian federalism is of sui generis type i.e. a type of its own. It doesnot fit into any tight fold of unitary federalism or others. 1. India has a single constitution subsuming provisions for the states aswell. 2. Emergency powers that allow for conversion of Indian federation into a unitary type without any formal amendment. 3. Elaborate division of powers and duties between the centre and the states through the list system. 4. States have no territorial integrity of their own, however they are sovereign entities in their own spheres. 5. Central and state administration being run by a common pool of officers i.e All India- Services.They are jointly controlled by both. 6. SIngle judiciary for both the centre and the states. 7. Though India is a federation but the constitution uses the term ‘Union of states’. It is so because the federation is not the product of an agreement between the units and the units have no right to break off from the union. 8. STrong central tilt is there, as we followed the Canadian model. Balance between American Judicial supremacy model and the british parliamentary supremacy model. 9. Only states form the union. Certain territories i.e. Union territories have no part in it. They are administered directly by the union government. Thus, Indian federalism is a unique case of its own. Marks : 3.0. Good, the unitary aspects of Indian federalism are stressed. You could have mentioned a few main federal aspects too. 1. India’s patent regime is in alignment with the WTO’s TRIPS agreement. i.e. the international patent regime. 2. India brought in amendments to its patent law in 2005 to comply with TRIPS provisions. 3. India recognised product patents like patents on pharma drugs through it. 4. India allows production of generic medicines under compulsory licensing provision of the TRIPS to make essential drugs affordable and available to general public. 5. Section 3(d) of Indian patent law discourages ‘evergreening’ of patents i.e. it doesnot allow patents on certain minor molecular modification which show no real enhancement over the previous product. 6. India refused patents to Novartis and Bayer owing to this rule. 1. AN IPR policy is needed to bring clarity on India’s stand on various IPR issues. Many countries like the US blame India for a discriminatory IPR regime for no real reason. 2. A predictable and tranparent framework of IPR laws that donot discourage investors. 3. There is a need to increase the manpower in our IPR infrastructure and offices to give speedy judgements. 4. A policy framewrok that encourages ‘greenfield investments’ and not just ‘brownfiled investments’. The latter can have implications of India’s health care system in the future. 5. Apropriate penal action on breach of IPR rules , for instance- India’s legal system and its enforcement is very soft on widpread piracy online and offline in Intellectual property like Books, Video Games and movies etc. Cyclone is the inwards whirling of winds in an area of low pressure or depression region, with an anticlockwise circulation in northern hemisphere and clockwise circulation in southern hemisphere. he formation of cyclone is although a complex process. 1.The temperate cyclones are those which occur in mid latitudes i.e. 40 degree to 60 degree N & S. .Whereas the tropical cyclones are those which occur in lower latitudes, normally 10 degree to 30 degree N & S latitudes. 2.The temperate cyclones are formed due to convergence of the warm (tropical) and Cold (Polar) air masses whereas the tropical cyclones are caused due to the convergence of warm dry and warm moist air masses. 3.The tropical cyclones do not experience fronts, or have very weak fronts whereas temperate cyclones have clear and well defined fronts. 4.The isobars of temperate cyclones are Wedge shaped or oval shaped whereas the isobars of tropical cyclones are circular. 5. The Temperate cyclones cover a larger area and can originate over the land and sea. Whereas the tropical cyclones originate only over the seas and on reaching the land they gets dissipated. 6. The extra tropical cyclone affects a much larger area as compared to the tropical cyclone. 7. The wind velocity in a tropical cyclone is much higher and it is more destructive. 8. The extra tropical cyclones move from west to east but tropical cyclones, move from east to west. The conflict of interest arises when a person’s own interest comes in conflict with the professional life or while serving at large. In such situation the decision or action to be taken becomes critical as he has to choose between the path of selfishness and selflessness. In a public office several times people gets offers, which can be in his/her own interest but compromising the profession, now and then and if a public officers get indulge in such activity it will not only be a violation of law but also is against of his own principles and values. Indulge of public officers at large in such will result in loose of faith on the system also. A public officer should not only keep himself out of such activity but also try to impact such principles and values to his sub-ordinates and encourage them to follow the ethical code of conduct also. It can be understood when a person being a supervisor of a PDS may indulge in corrupt activities and in lieu of ransom, he diverts some of the allocated grains and cereals to some mafia or kept himself for his family.